The thinner our devices become, the less room there is for speakers and other thicker components. Kyocera has a solution, however: it just modified its Smart Sonic Receiver conduction technology for use with conventional, over-the-air audio. The company's new Smart Sonic Sound device still relies on a piezoelectric actuator, but vibrates against a film to generate as much volume as a regular speaker in a far thinner (under 1.5mm thick) design. The new speaker might even sound better than its traditional counterparts. It delivers full volume and quality in a 180-degree listening arc, and it's responsive enough to recreate very subtle noises. Smart Sonic Sound is already shipping in LG's 55-inch curved OLED TV, and Kyocera expects it to reach laptops, tablets and other devices where interior space is valuable. Update: Our colleagues at Engadget Japanese have posted their first-hand look at Kyocera's speaker technology, complete with a gallery of live photos; we've posted two of them here. Kyocera Corporation (NYSE:KYO)(TOKYO:6971) today announced that it has developed an ultra-thin, lightweight (medium-size model thickness: 1mm; weight: 7g) audio device, called "Smart Sonic® Sound." The new product is based on the company's long history of pioneering fine ceramic technology and utilizes a piezoelectric actuator combined with a special film to create a piezo film speaker. Smart Sonic Sound will not only contribute to making digital devices even thinner - such as flat-screen TVs, PCs and tablets - but also enhances audio quality for a much more realistic audio experience. Its low directivity characteristics broaden the sound projection range, providing 180-degree sound quality and bringing delicate and minute sounds to life. 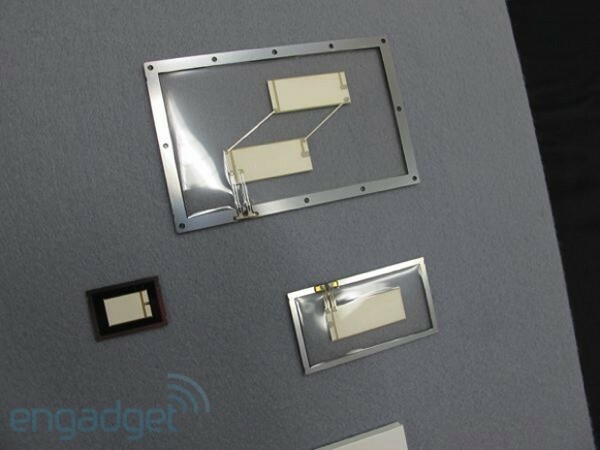 This innovative piezo actuator audio technology is being utilized in a flat-screen television for the first time*1 by LG Electronics, Inc. in the company's new 55" curved-screen OLED TV. Smart Sonic Sound comes in three different sizes (large, medium and small), and Kyocera plans to expand its use in a broad range of applications including digital devices and automotive applications with strict weight requirements. The piezo actuator used in the new product was born from Kyocera's proprietary fine ceramic material technology and lamination technology, combined with a special film. Smart Sonic Sound can create the same audio volume as conventional electromagnetic speakers in just a fraction of the width and weight. This allows for the speaker device to be built onto the front face of an end-product with ease - contributing to flexibility and enhancements in end-product designs. As the new product's piezo actuator and film create sound through vibrations, the directivity (directional projection of sound waves) is more balanced than a conventional speaker, meaning that sound quality and volume are delivered almost completely equally within a 180 degree range. Moreover, the high speed of responsivity in the Smart Sonic Sound is able to reproduce delicate and minute sounds such as raindrops and background effects with greater clarity, thus providing an even more realistic audio experience. Kyocera has developed a range of piezo actuator products using the company's proprietary technology. Among the wide range of applications, some notable examples include: actuators*2 for diesel-engine vehicles requiring high reliability; actuators*3 in the world's fastest inkjet printhead*4 used for on-demand printing applications; as well as Kyocera's Smart Sonic Receiver. *1 The world's first use of a ceramic piezoelectric actuator as the sound device for a flat-screen television. As of July 31, 2013; based on research by Kyocera.